At least three ski resorts have opened early and several more will open this week after fresh powder blanketed parts of the Sierra on Monday following a winter-like storm. Boreal Mountain Resort was the first ski resort in Northern California to open for the season when lifts started running last Friday. "After a long summer of preparations, we're more ready than we have ever been to kick off the winter season," said Boreal Mountain Resort Vice President Matt Peterson. Heavenly Mountain Resort and Northstar California will kick off the ski season six days earlier than initially planned, with both Lake Tahoe ski resorts opening Saturday. Already, Mt. Rose Ski Tahoe and Mammoth Mountain are also operating lifts. Alpine Meadows opens Thursday and Squaw Valley Ski Resort will also be up and running Saturday. 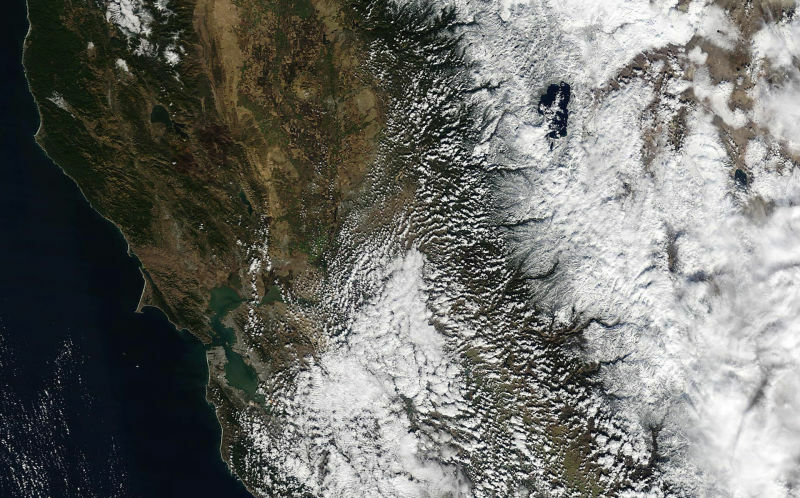 On Monday, a two-day wet system moving across California brought cool, wet weather to low-lying areas and snow to the mountains. The welcome moisture will not end the state's four-year drought, but forecasters expect a strong El Niño winter to bring above-average precipitation to parts of the state. The snow in the mountains is also bringing business to the lowlands. Ed Beyeler co-owns MountainWest ski shop in San Francisco and told the San Francisco Chronicle that business was bustling over the weekend with skiers and boarders headed to the Sierra. Typically, the mountains and their ski resorts are barren before Thanksgiving. The larger resorts that are open have large snowmaking operations, but even the smaller resorts, such as China Peak Mountain Resort in Lakeshore, California, are optimistic about a good snow season. Tim Cohee, owner of China Peak, said Tuesday that they are inching toward opening the Saturday before Thanksgiving. They had more than a foot of snow last week and about 7 inches since Sunday. "It's certainly a lot better than it has been," said Cohee. Last year, the Central California resort closed early for the season for lack of snow. "The last couple years have been beyond anyone's imagination for how bad it could be," he added. "It's already way better. It's been such a rough ride for skiers and snowboarders that everyone in the state feels an obligation to open early." California's 27 resorts -- and two in neighboring Nevada -- make up the nation's second-most-popular destination for skiers and snowboarders after Colorado, said Bob Roberts, executive director of the California Ski Industry Association.